The Bachelor of Science in Elementary Education degree offers licensure in kindergarten through sixth grade. Students, who take courses in social studies, literature and literacy, math and science, have a minimum of three semesters of clinical coursework in a variety of school settings prior to graduation. 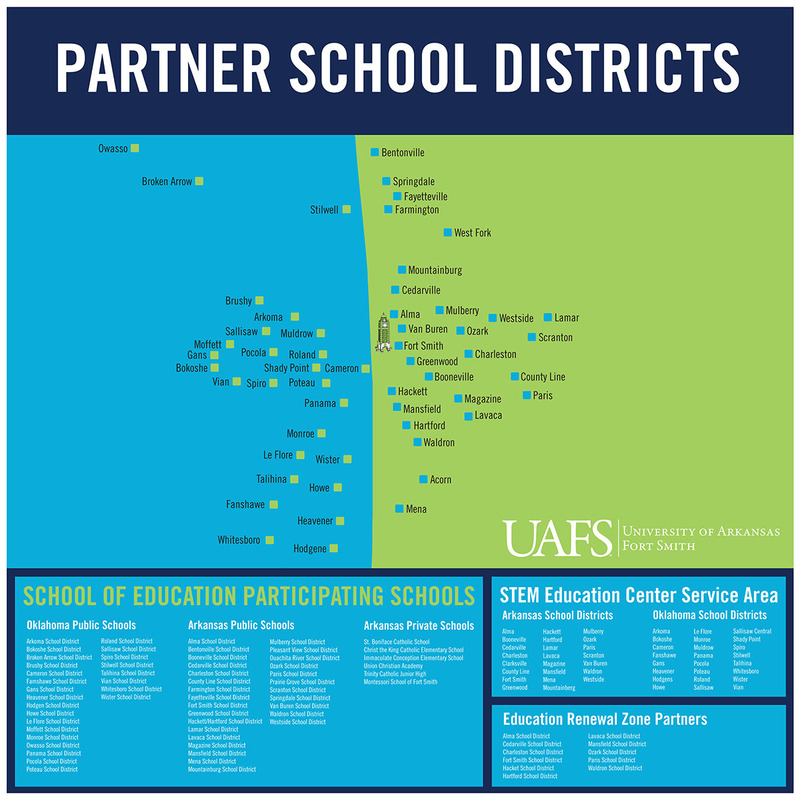 UAFS is one of two teacher education programs in the state to incorporate Professional Development Schools. Selected courses are taught on-site in the public schools, in two different school districts, thus providing greater opportunity to implement instructional strategies directly with public school students. Teacher candidates visit classrooms to see teaching strategies in action. The Council for the Accreditation of Educator Preparation (CAEP) was founded to accredit teacher certification programs at U.S. colleges and universities. CAEP is a council of educators created to ensure and raise the quality of preparation for their profession. CAEP is recognized as an accrediting institution by the U.S. Department of Education. A special congratulations recommended UAFS for this accreditation because the Council “…cited no areas for improvement relative to any of the standards.” This is formal recognition and a guarantee that the School of Education and all of its programs and practices meet and exceed rigorous state and national standards and that quality teacher preparation is provided equivalent to the nation’s top colleges and universities. Content Knowledge. Demonstrate content knowledge by successfully completing the appropriate PRAXIS II content exam. Learner & Learning. Demonstrate an appropriate response to diversity in the classroom by successfully completing a diversity case study. Instructional Planning & Practice. Successfully develop and implement an integrated unit of study. Professional Responsibility. Successfully collaborate with colleagues, families, and community members which will be evaluated by an end-of- program portfolio presentation of an artifact.